A $4.2 million taxiway relocation project at the Scappoose Industrial Airpark is finally complete. The Port of Columbia County announced last week that contractors have finished construction on the Taxiway-B Relocation project in Scappoose. The project required the old taxiway to be replaced with a new strip, 15 feet to the west, as well as new runway lights, the port stated in a news release. Scappoose Industrial Airpark is owned and managed by the port. 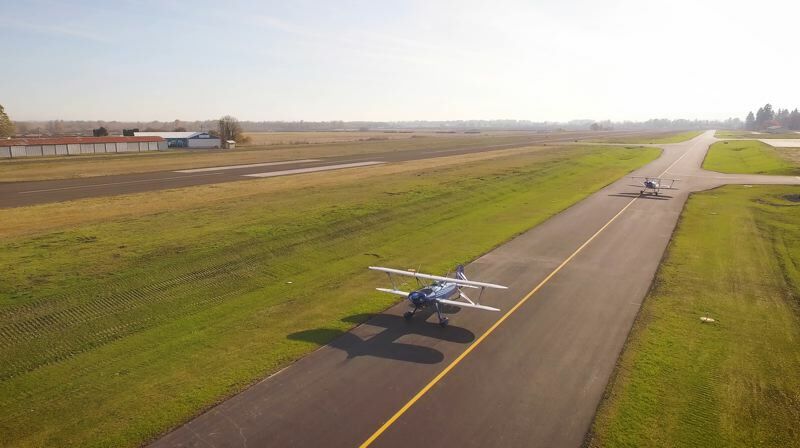 "The taxiway relocation was necessary to bring the airpark up to current standards for safety and traffic separation and is also included in the airpark's updated master plan," Gina Sisco, public relations manager for the port, stated in the release. The project cost more than $4.2 million, paid for primarily by a $3.8 million Federal Aviation Administration grant for airport improvements. Additional grant funds from the Oregon Department of Aviation helped cover another $150,000 of project fees, leaving the port to foot $292,000 of the bill, the agency noted. Construction company Tapani Inc. was hired to complete the project, and did so ahead of schedule and under budget, according to the port.